The Upper Tropospheric humidity isn't reducing in order to initiate the Monsoon withdrawal process for starters. Consecutive WDs inducing troughs in Central Pakistan and adjoining Rajasthan are another factor in delaying the withdrawal, despite NW winds blowing over some parts of NW India. The Monsoon is still active up to as far north as East Rajasthan and NW Madhya Pradesh. What do you foresee Rajesh Sir? OLR, Jet Streams and upper air anticyclone are present and persistent in the NW region. The WD trough which i mentioned 2 days ago will move away, having brought rains in E. Rajasthan and NW Madhya Pradesh as said by Ishan. Moving away now (trough in upper air WD), a few days of rainless atmosphere and the SW Monsoon will withdraw from Extreme West Raj and Kutch and Sindh in the next 72 hrs....Posted 13th September. Hi Rajesh, is there a possibility of a new low forming in the Bay in the coming days ? And if so, will it again take the path from Orissa to MP to Gujarat? Thanks. 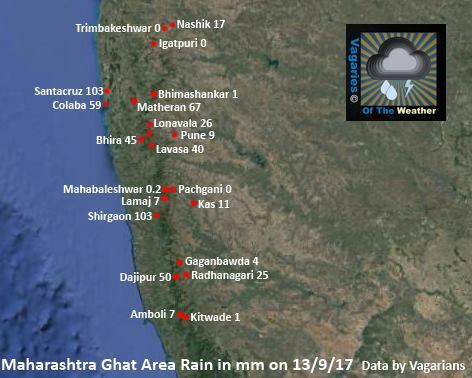 "IMD believes the second half of September could bring better rains in central India. 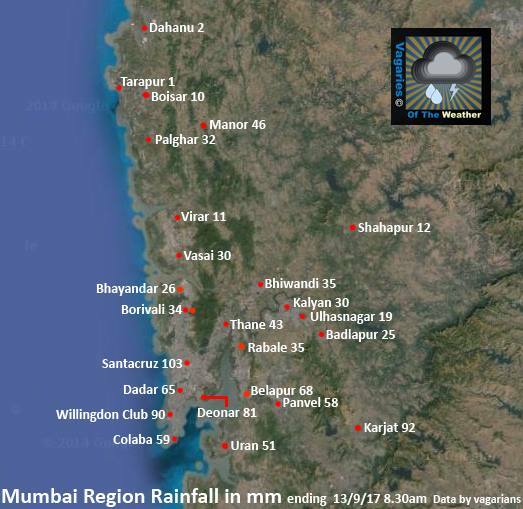 "While the situation in northwest is not likely to change too much, there are indications that central India may get some rain in the next couple of weeks. Monsoon isn't likely to start withdrawing in the next few days," Pai said." What the hell? Thunder n lighting started in Goregaon, 10 minutes back. From khar to borivali thunder and lightning with heavy to moderate rains. Surprisingly Dahisar totally Dry.